Apple Harvest Quinoa. Photo Credit Emily Wiley. Have you cooked with quinoa? If not, you should. Yes, it’s packed with protein and essential amino acids, but it’s also light and fluffy and mildly nutty. It provides the perfect canvas for a variety of fall flavor combinations: honey and berries, chicken stock and leafy greens, carrots and tart apples, even vegetarian meatballs. 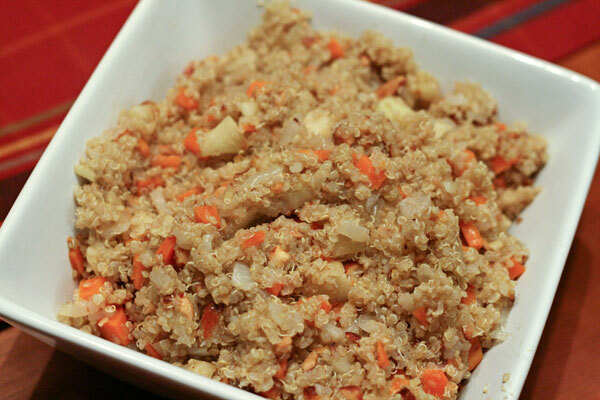 We turned our first batch of quinoa into a slightly sweet and spicy side dish to serve alongside salmon. Heat 1 teaspoon oil in saucepan over medium-high heat. Add onion, carrot, and garlic to pan. Sauté 5 minutes or until onion is tender and carrot begins to brown. Stir in broth, quinoa, salt, and cinnamon; bring to a boil. Cover, reduce heat, and simmer 20 minutes or until liquid is absorbed. Remove from heat. Fluff with a fork; keep warm. WPSU is now a member of Amazon's Associate program. When you make purchases from Amazon by following links from our website, WPSU will receive a portion of the sale with NO extra cost to you. Buy Cooking Light: Cooking Through the Seasons.